In this talk Paul Goddard, clinical hypnotherapist, will take you on a new journey into the fascinating world of reincarnation and past-life regression. Hear more compelling stories from children who claim to have lived before. Take the opportunity to experience your own past lives through group hypnosis. This time volunteers are encouraged to come with writing materials so that any information brought up in the hypnosis session can be searched on the Internet during the interval. This talk is for both sceptics and believers and will investigate the age old question: do we survive physical death or not? Have you ever felt pressurised into doing something you didn’t want to do? Buying something you didn’t want to buy because you have been manipulated? If so, then this is the talk for you. 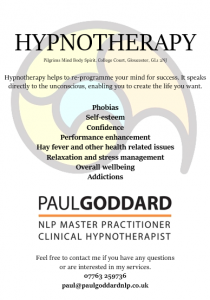 Paul Goddard, clinical hypnotherapist and Master practitioner of Neuro Linguistic Programming, demonstrates how you can get the result you want but still be authentic. You will learn strategies beyond conventional NLP training and understand the core wants that drive all of us to act as we do. You will learn the tricks that the unscrupulous use so that you can avoid falling into these traps on the future. 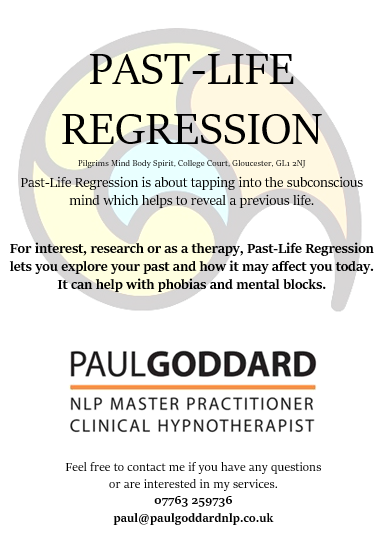 My next event is on the 3rd February 2016 and is a talk on Past-Life Regression. It takes place at the Isbourne Holistic Centre at 7pm-9pm, and costs £7.50. Follow the link here for a shortened talk on Past-Life Regression. Please buy your tickets from the Isbourne Holistic Centre once ticket sales have opened. 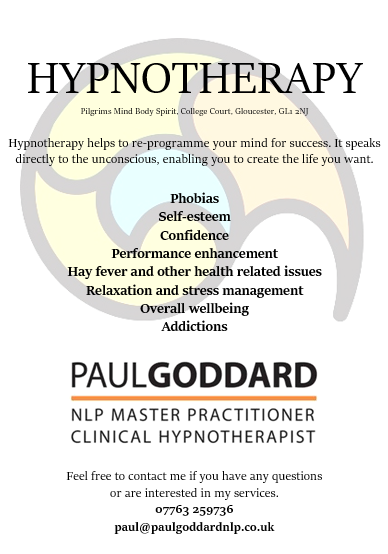 Keep up to date for ticket openings on my Facebook page; Paul Goddard NLP and Hypnotherapy. I can also be found at Pilgrims on Wednesday and Friday afternoons. Below you can find some of my previous workshops and events. If you are interested in having me at one of your events, then please contact me. I can also work with businesses for their away days and performance enhancement workshops. A Hypnotherapy CD with pdf workbook was included. 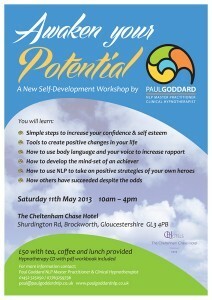 This workshop was held at The Cheltenham Chase Hotel, Shurdington Rd, Brockworth 11th May 2013, 10am till 4pm. £50 with tea, coffee and lunch provided. 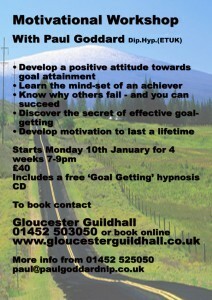 Running a motivation course at the Gloucester Guildhall. £40.00 for four 2 hour sessions to help you make your new year’s resolutions last. This course (Motivational Techniques) will be starting Monday 10th January, 2011 through to 31st January, 2011 7pm ‘til 9pm. I ran a motivation course at the Gloucester Guildhall at only £40.00 for the day. 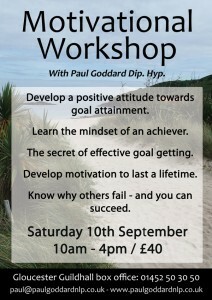 This course (Motivational Techniques) was on Saturday 10th September, 2011 10am-4pm.